The Train No.04408 Hazrat Nizamuddin-Durg Weekly AC Superfast Express Special Train will start from Hazrat Nizamuddin at 03.55 p.m. on every Thursday from 07 September 2017 to 26 October 2017 to reach Durg at 12.50 (noon) the next day (08 trips). In the return direction, the Train No.04407 Durg- Hazrat Nizamuddin Weekly AC Superfast Express Special Train will start from Durg at 07.05 a.m. on every Sunday from 10 September 2017 to 29 October 2017 to reach Hazrat Nizamuddin at 04.30 a.m. next day (08 trips). 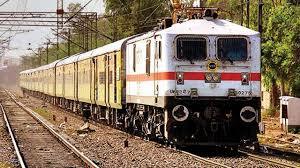 Composition and Route: These special trains will have one AC First Class , four AC two and eight AC three tier coaches the 04408/04407 Hazrat Nizamuddin-Durg- Hazrat Nizamuddin Weekly AC superfast Express Special Train will stop at Jhansi, Saugor, Damoh, Katni Murwara, Umaria, Shahdol, Anuppur, Pendra Road, Bilaspur, Bhatapara and Raipur stations enroute in both the directions.